I started shaving my legs in the 4th grade. 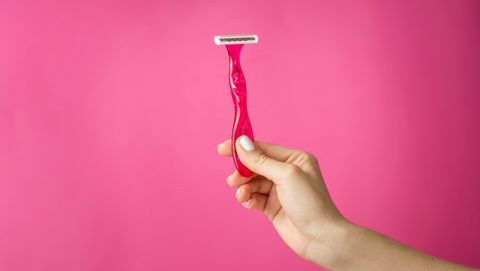 My friend, a porcelain-skinned red head named Christina, had “borrowed” her dad’s razor and taught herself how to do it. She pointed out the dark hair on my own pale calves and told me I ought to do the same. It was spring time, shorts weather, and our whole class was excited about the new tire swing we’d just gotten. Each recess we’d line up and wait our turns. I looked at the other girls’ legs as they climbed into the tire swing. Mine were definitely the hairiest. Three kids liked to push the tire swing. One was my crush and advanced math partner, Zach. Each day I’d wait in line and select Zach to push me on the tire swing. I imagined that if I started shaving, Zach would notice my hairless calves as I climbed onto the tire swing and be impressed by how mature I was. This would inevitably lead to him being my boyfriend. That means that I have been shaving my legs and underarms for 23 years. That likely equals hours of my life devoted to hair removal (not to mention eyebrows, upper lip, bikini line, or other stray hair). Lots of money on little pink razors, lots of nicks and cuts. Once, I even contracted a weird bacterial infection due to shaving (dull razor + questionable lake water). During all that time I never questioned the idea that a beautiful woman is a hairless woman. But lately I’ve been pondering all this time and money I spend to appear more feminine. Why am I scared of or ashamed of my body in its natural state? Who am I doing all of this for? I stopped shaving 6 weeks ago. Dark hair has filled in on my calves and in my arm pits. I am simultaneously fascinated and disgusted by it. It’s so unfeminine, but it’s also kind of amazing. It’s like I have tiny cat whiskers all over my legs. When I walk outside bare-legged, I feel the slightest breeze. When I was in middle school, I got really into Frida Kahlo. One of the things that initially fascinated me was her facial hair, which she made no attempts to remove, except when angry at her philandering husband (who, purportedly loved it). As I learned about her art, I saw how she explored many facets of her identity and experience—her facial hair seems an interesting symbol of her willing to play with overlapping identities. Learning about Kahlo as a teen helped me accept my body and view myself as artist, not object. At this time in my life, I ought to be settled. I am, after all, a grown up, home-owning, PTA mom, yet I find myself questioning things more and more. Why do things have to be this way or that? Why do we have to be masculine or feminine? Right or wrong? Christian or unbeliever? These questions resist easy answers and deadlines to decide. And if Kahlo taught me anything, it was that it’s OK to dwell in the inbetween.